Return boat & land transfer, entrance fee, jetty fee,snorkeling equipments, BBQ fee & BBQ lunch, tour guide. Take boat ride towards the Sapi Island within 15-20 minutes arrive at the Island. Be mesmerized by the colorful fishes transparent by the crystal clear blue sea and vast greeneries surrounding the Island. The island furnish with changing rooms, toilets, picnic shelters and tables for recreational use. Just relax under the sun or enjoy the white sandy beach with sandcastles or go snorkeling and look for beautiful corals and fishes. BBQ lunch will be served by 12 noon. Free at leisure for relaxing or an option for water sports such as kayaking, wind surfing, parasailing, fly-fish, banana boat ride, jet skiing, fish feeding and many more! You may participate such water sports in any of the islands. 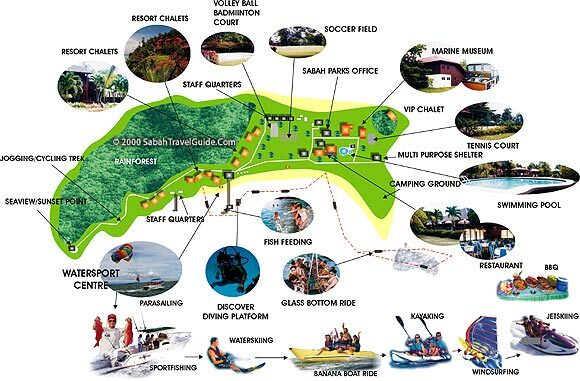 Above watersports could be arranged at either one island, no prebook is required. Save more with our Twin Island + Sea Walking combo package! Pickup from hotel, proceed to jetty and take boat ride towards Manukan Island. Be mesmerized by the colorful fishes transparent by the crystal clear blue sea and vast greeneries surrounding the island. BBQ lunch will be served at Manukan Island. Transfer to Sapi Island. Free at leisure for relaxing, or an option for water sports. Recommend to bring: hat, sun block, extra clothes and towel. Activities fee are not included, please contact the management office in the island. No locker on islands, please take care of own belongings, do not carry valuables. Surcharge of MYR20 per person applied for pickup location in Putatan and Kepayan area (eg. Narada Hotel, Hotel No.5).